[ARCHIVED THREAD] - A little something to lighten up the mood arround here!! At least we are not canadians!!! Here's my AR, it's almost done. I just need the BCM extractor, 9mm buffer and a YHM eotech mount and then I can start focusing on my SBR/9mm build. Here's the foundation for the 9mm/SBR build. Nice rifle! The BUIS you have on it. Is that as far back as it would go, or is that just what you eneded up liking for it's position? It's as far back as I can go. That actually is my only complaint about the Larue fixed BUIS. Then again a flip would mount in the same spot on the rail but it would be offset back on top of the carry handle. I'm sporting a DD rail also. It's the older DD M4 but I got it for $200 shipped and it being the lightest handguard you can buy, it goes well with the A1 pencil barrel. And the boy showing his stuff. Maybe it's just the photo, because it seemed like it was forward of what I'm used to seeing. 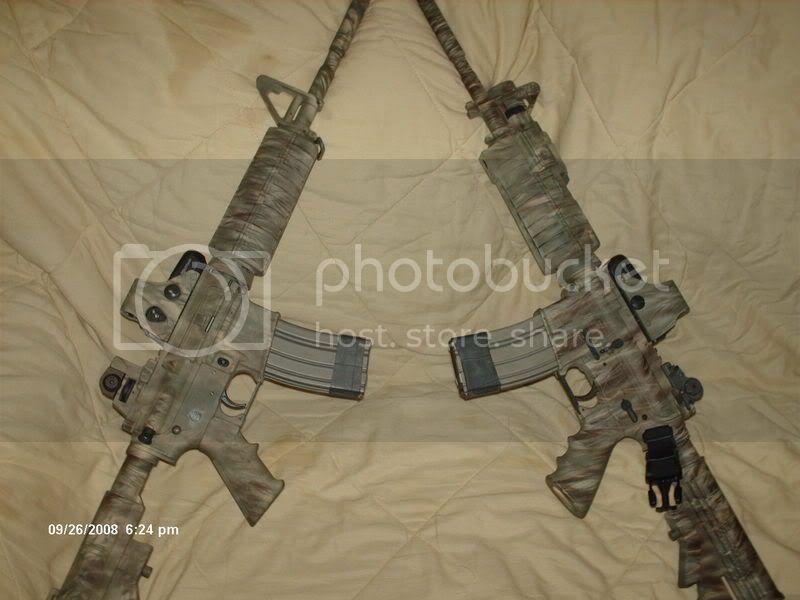 The one on the left is a detachable carry handle I cut down for a BUIS, and the one on the right is an ARMS #40. 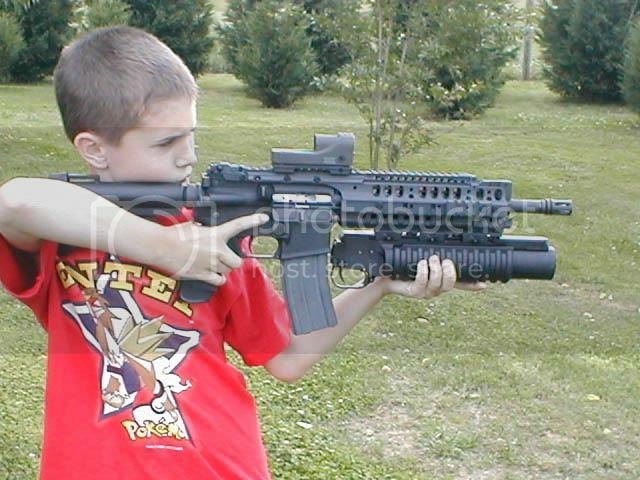 I like both they look great VA.
Another nice rifle and a cute kid too. Thanks he's a good kid. Future National Champion Wrestler you're looking at there. Since we're putting up kid pics. This one is from a few years back though. My son, but not my rifle. It's my buddies M16 with an LMT M203 on the front. I still haven't taken my 11 YO daughter shooting. That's one I've always wanted to add to the collection and never got around too. Did any of you pick up one of the "unissued" 59/66's yugo's when the getting was good last year? I can't believe how nice they clean up. Besides my custom SP101 I got for $200, the 59/66 was the best $200 I've ever spent on a firearm. Once you learn how to use the stripper clips, this is a very effective battle rifle. Olympic Arms Car.....I know everyone hates Olympic Arms but I got it for a steal and it's a good plinker. Haven't had a problem with it yet. 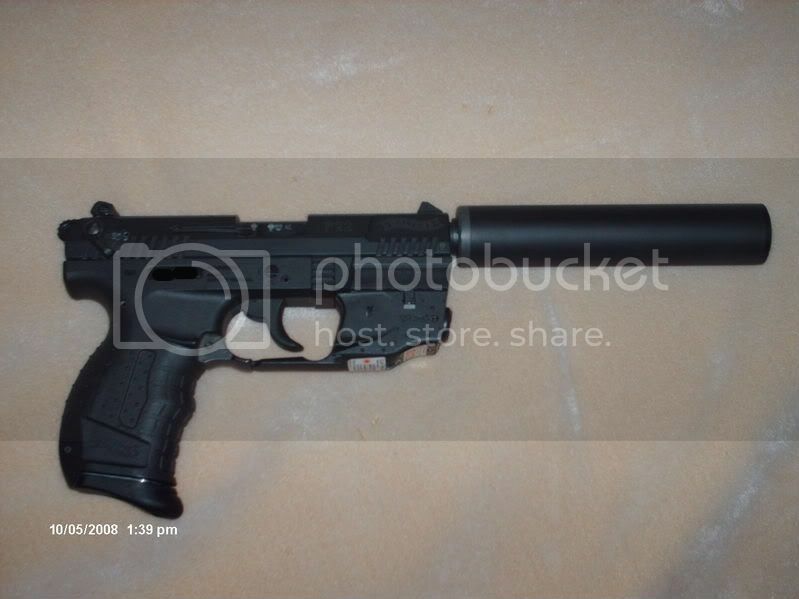 I don't know why but I have this deep desire for a silenced .22lr. For some people they think it doesn't make any sense, for me I think it's the ideal caliber to silence. Nice that is something I'm leaning towards myself but on a different pistol, consecutive serial #'s. No real suppressors yet but I'm getting there. So many things to buy, not enough money but hopefully enough time. I think this is going to be my next pistol buy. Just looks freaking mean sitting there. My junkyard dog for sure. LOTS of little tweaks all over place. I really need to lock up the files and give someone the key. What fun would that be now! I love the photo file name "GripTape". Very nice I'm gonna have to get myself an education on that build. LOL it turns out you where right, I didn't have the BUIS all the way back.